We currently do not have any albums listed on our website for Flyleaf. If you know of any album we are missing for Flyleaf, please contact us via email. Flyleaf is an American rock band, formed in the Belton and Temple, Texas regions in 2000. 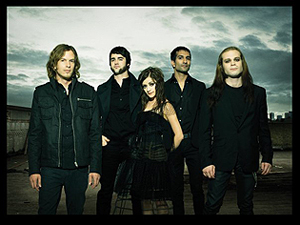 They performed around the United States in 2003 until releasing their eponymous debut album, Flyleaf, in 2005. The album went platinum after selling more than one million copies. The band won an online poll on yahoo.com and was named Yahoo! 's Who's Next band of the month in March 2006 and they were named MTV's artist of the week on December 24, 2007. Flyleaf released their second album Memento Mori on November 10, 2009 which debuted and peaked at No. 8 on the Billboard charts.